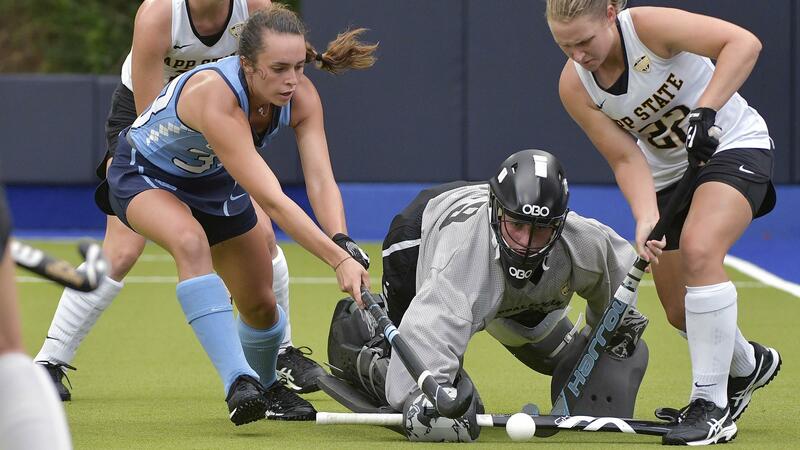 Erin Matson and Marissa Creatore each scored twice Tuesday evening in Chapel Hill as the UNC field hockey team defeated the visiting Appalachian State Mountaineers 6-0 to improve its record to 7-0 in 2018. Creatore scored the opening goal just over 10 minutes into the game–right after a nearly two-hour rain delay–and then followed up with another one just three minutes later to give the Tar Heels a comfortable lead early on. By halftime, goals from Feline Guenther and Matson had made it a 4-0 scoreline–erasing all doubt about the final outcome. The Tar Heels still added two more tallies in the second half, one from Matson and another from Cassie Sumfest, to match their highest scoring total of the season. UNC’s next scheduled game is on Sept. 21 against Duke, as Hurricane Florence postponed scheduled home games against Virginia and James Madison this weekend.